Time for my weekly thoughts on college track. This time it’s a look back at history caused by action in the present. Shawn Barber broke his own Canadian pole vault record on Saturday in Reno at the Pole Vault Summit with an even 6.00 meter clearance (19′ 8¼”). It makes him the 19th man ever to clear the height, indoors or out (and only the 8th since the crossbar pegs were shortened in 2003) and one of only three to do it before their 22nd birthday. 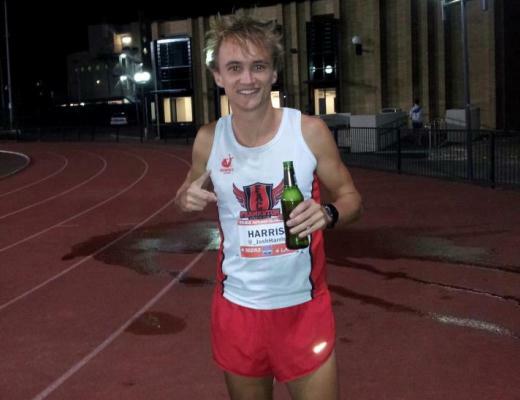 Next week he travels to France to take on world record-holder Renaud Lavillenie, the same man he beat for last year’s World Championships gold medal. After winning the Worlds, Barber gave up his remaining eligibility at the University of Akron to sign a sponsorship agreement with Nike. I was hoping he’d stay on the team (in no small part because I will be the PA announcer at this year’s Mid-American Conference Championships), but that wasn’t likely. I’m a product of the Mid-American Conference too, although my athletic accomplishments are a bit more modest (in brief: the coaches let me come to practice). Barber’s accomplishments got me to wondering: who are the greatest track & field athletes to come out of the MAC? Admittedly, it’s not the most competitive conference in college sports, but it has produced more stars than you might think. Here’s what I came up with. Jones is without a doubt the most accomplished athlete on this list. He won two Olympic medals in the 110 meter hurdles — bronze in 1960 and gold in 1964 — and four times was the world’s #1-ranked hurdler over his eight years at the international level. He was especially good indoors, where he went undefeated over the final 55 races of his career, and was a good enough as a flat sprinter to be on a world-record setting relay. But…does he belong here? 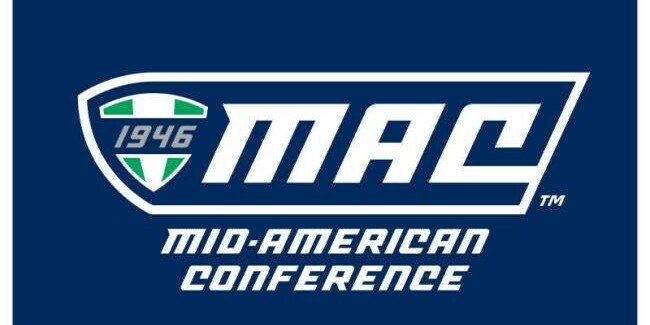 Eastern Michigan did not join the MAC until 1971. The Hurons were members of the Illinois Intercollegiate Athletic Conference during Jones’ time on campus. You be the judge. I’m putting him at the top of the list, but with an asterisk. Wottle is known mostly for winning the 1972 Olympic 800 meters with one of the all-time great come-from-behind finishes. He accomplished a whole lot more than just that during his college years (his career essentially ended shortly after graduation, which was common at the time). He tied the 800 meter world record, set the still-standing NCAA Championships mile record (and won four NCAA titles), was one of the few men to beat Steve Prefontaine at Hayward Field, was the cornerstone of the MAC’s only NCAA Track & Field Championships runner-up team, and is the only MAC product to earn Track and Field News world rankings in multiple events. Schul had only one year in which he made an impact at the worldwide level but he chose well. It was 1964, when he broke the 2 mile world record, twice beat Ron Clarke, and won Olympic gold in the 5000 meters. Unlike Wottle, his success came well after his college days were over. Wottle and Schul rate as the best because they each had a season in which they were indisputably the best in the world at their event, won Olympic gold, and set world records. Barber has the first of those and has equaled the second with a Worlds gold, but the third, a world record, is a far harder nut to crack these days than it was in the 60s or 70s. In any case, it won’t be long before Barber exceeds the two above by virtue of having a second season as the best in the world at his event. Crawford had a long and distinguished career, highlighted by winning the 1976 Olympic 100 meters for his native Trinidad & Tobago. He competed in four Olympics, although only in 1976 did he qualify to the final. He twice won bronze at the Commonwealth Games (1970, 1978) and twice was world-ranked #2 by TFN (1973, 1976). It’s not unusual for a top athlete to transfer out of the MAC to a larger, better funded university, in track or any other sport, and I did not consider such athletes for this ranking. Murchison went the other way; he started at Iowa and then transferred to Western Michigan. Military service led to a small gap in his time at WMU, but he kept on sprinting and thrice tied the 100 meter world record (10.2 twice, 10.1 once). He took fourth at the 1956 Olympics and led off the gold-medal winning 4×100. Murchison is recognizable below due to his short stature (5′ 5″). Upon his return to WMU in 1957, he won the national indoor title and tied the world record at 60 yards, and took 2nd and 1st at the 1957 and ’58 NCAA 100 yard finals. He ranks fifth because, unlike the four ahead of him, there was never a time when he was indisputably the best in the world. No, not that Tom Jones. 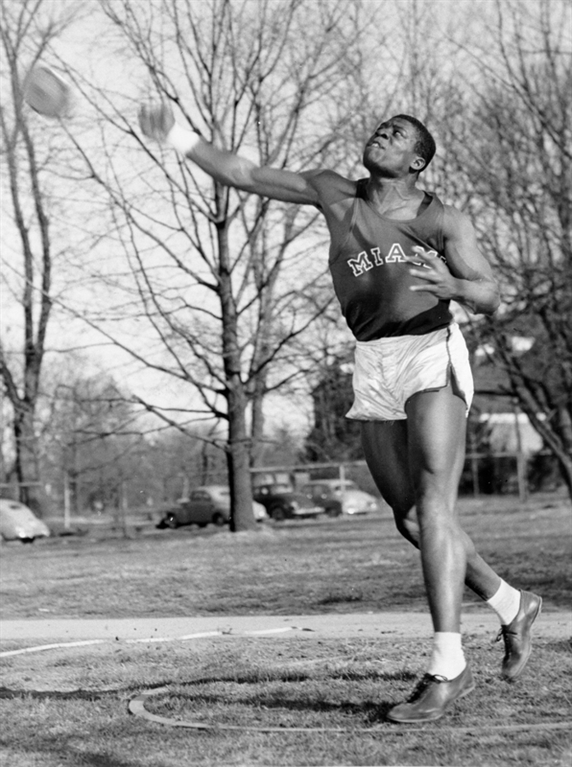 Miami’s Tom Jones was a three-time All-American shot putter who won the NCAA title in 1954 and made the TFN World Rankings three times, peaking out at #2 in 1955. That fall he played two games as a defensive tackle for the Cleveland Browns, which in those strictly amateur days meant the end of any Olympic aspirations he may have had. His best mark of 59′ 1″ stood as the Miami school record until 2014. Jones’ finest moment was probably his 800 meter bronze medal at the 1984 Olympics behind Joaquim Cruz and Sebastian Coe, but he had plenty of others. At that year’s Olympic Trials he beat the legendary Johnny Gray by an inch or so, both timed in an American Record of 1:43.74, and in 1986 he recorded his PR of 1:43.62. The 1984 Olympics rekindled a patriotic American spirit, and a guy named Thomas Jefferson was in the middle of it with an Olympic bronze medal. Surprisingly, he never made it to an NCAA sprint final until after his Olympic heroics, and in a different event: his medal was over 200 meters, his lone NCAA top-eight finish was in the 100. He stayed in track all the way until 1991, when he recorded his PR of 20.21. In the 1958 NCAA Championships, Carney broke the 220 yard meet record in the semifinals with a 20.8 second clocking, but finished a disappointing seventh in the final. The next year he finished third, and then kept on getting better. He won silver at the 1959 Pan-American Games and another silver in the 1960 Olympics. He was better known as a running back at Ohio U. than as a sprinter (because isn’t that always how it is?) but never played in the NFL. Logan never made it into the Track and Field News world rankings, but he did make his way onto four Olympic teams: 1984, ’88, ’92 and 2000. He was not able to try for the 1996 team because of a four-year doping suspension incurred at the ’92 games. He never scored at the NCAAs for Kent State but was a five-time USA champion. Jack Bacheler (distance, Miami): One of the founding members of the Florida Track Club (and a model for the Bruce Denton character in Once a Runner), he won three US titles and ran on two Olympic teams, finishing ninth in the 1972 Olympic marathon. Mo Banton (distance, Ohio U): He was the MAC’s first NCAA cross country champion and the NCAA’s first African-American cross country champion. As a coach, his Bobcats were always well-prepared and ferocious competitors; his women’s team once reeled off six consecutive MAC cross country titles. Boaz Cheboiywo (distance, EMU): The only other MAC athlete to win the NCAA cross country title also won an NCAA 10,000 meters. *Jim Gordon (400, Miami): He finished fifth in the 1932 Olympic 400 meters but never competed in the MAC—the conference didn’t exist until 1947. Kim Kreiner (javelin, Kent State) If you’re noting a distinct lack of women in this listing, it’s because the MAC hasn’t been very good in women’s track. Kreiner is probably the best in conference history; she was a four-time USA champion and held the American Record for eight years. Briana Shook (distance, Toledo): The other highly accomplished woman from the MAC held the steeplechase American Record, but unfortunately will be best remembered for missing the turn for the first water jump at the 2004 Olympic Trials. Sid Sink (distance, Bowling Green): He won three NCAA titles between 1970 and ’72 and set the steeplechase American Record in 1971, but sciatica issues severely hampered his efforts heading towards the ’72 Olympic Trials. 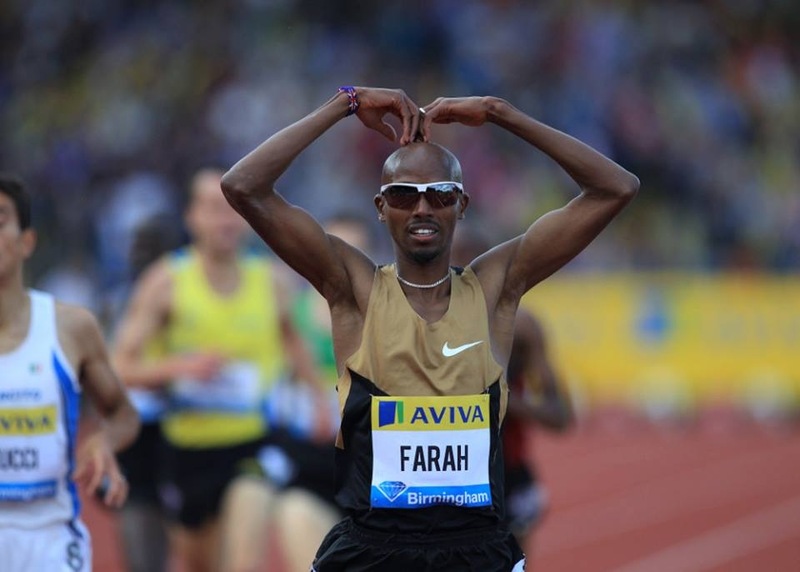 After bombing in the Trials steeple, he came up just short of making the team in the 5000. Emmett Taylor (long sprints, Ohio U): The two-time NCAA champion (1967 440y, 1968 200m) also twice made the TFN World Rankings. 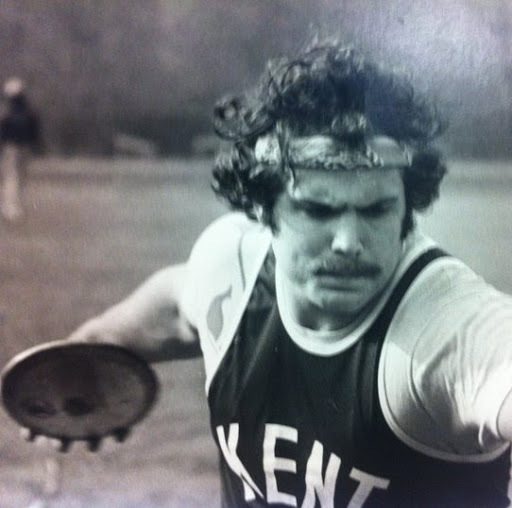 LATE EDIT: As pointed out in the comments, I neglected Gerald Tinker (sprints, Kent State). After a fourth-place finish in the 100 meters at the ’72 Olympic Trials (by 0.05 seconds) he ran a strong third leg on the gold-medal winning 4×100. His lone TFN world ranking was #8 in 1972, and he played eight NFL games over three years for the Falcons and Packers with a great percentage: two career touchdowns on eight career receptions. One of the great upsets in college cross country took place at the 1965 NCAA Championships when Western Michigan won the title over heavily favored Oregon. The next year the championship race distance increased from 4 miles to 6 miles and the meet moved away from East Lansing for the first time, but Western pulled it off again. Sandwiched in between those cross country seasons was a track season during which the Broncos beat Michigan State, the Big Ten champions, in a triangular. 1966 was the last of a nine-year MAC Championships win streak for Western. Only one team included two of the athletes listed above, and it was this one. The Falcons came one point away from winning the 1972 NCAA Indoor Championships, and basically all the points came from Wottle and Sink: wins in the 880 (Wottle), the two-mile (Sink), and the distance medley (paired up for the last two legs). No other MAC team in any sport finished first or second at an NCAAs until the Falcons’ legendary win at the 1984 hockey championship. BG’s cross country teams finished 9th, 7th, 6th and 5th at the NCAAs over the 1969-72 period—but only once (’71) were they the top MAC team in the meet. In 1973, BG’s 4-mile relay broke the American and Drake Relays record with a 16:19.4 clocking, then flew to Philadelphia to attempt an impossible double the next day at the Penn Relays. It really was impossible, as they finished second to an Eamonn Coghlan-led Villanova team. Not all teams took cross country seriously in 1965, but by 2002 they certainly did. Cheboiywo a year past his individual cross country title and could not repeat, but he took seventh with Gavin Thompson five seconds back in 13th to push the Eagles to their best team finish in the university’s long and storied history. The Broncos finished fifth at the 1961 NCAA Championships, but that wasn’t all they did in that era. They finished third at both the 1960 and ’62 NCAA cross country championships (the first years that western teams came and made it a truly national meet), they beat Big Ten track champs Michigan in a dual meet, they set an American record in the 4xmile relay, and won the Central Collegiate indoor title. The assistant coach of Western’s national championship teams was Bob Parks, who went on to a Hall of Fame career as Eastern’s head coach. These were his best teams: 7th at the ’74 NCAA indoors, 6th at the ’74 NCAA cross country, and 4th at the ’75 NCAA indoors. The Hurons, as they were then known, swept the ’74 and ’75 Central Collegiate Conference indoor titles. Hall retires, Felix double activated and what the hell happened with the WADA report? The Monday Morning Run…. I think you forgot about Gerald Tinker, Kent State, Olympic Gold Medalist (4×100), 1972, I think. One notable omission on the women’s side would be Ball State’s LaTasha Jenkins, who was the NCAA Champ in the 200m in 1999, setting an American Collegiate record in the process which stood until just a couple of years ago. She was also the NCAA runner-up in the 200m in 1998, and won four straight MAC titles in the same event. After graduation, she was part of a World-Record setting 4 x 200 at the 2000 Penn Relays and also earned silver medals at the World Indoor Championships and the World Outdoor Championships in 2001. Via e-mail, former BGSU women’s head coach Steve Price made a worthy nominated of Western Michigan’s John Bork, who was NCAA champion at 880 yards in 1961 and made #6 in the TFN world rankings.